The dive site Phoenix shoal is an inshore rocky reef and historical wreck in the Seaforth area on the False Bay coast of the Cape Peninsula, near Cape Town in the Western Cape province of South Africa. Wreckage is 80m due 001°T (025°magnetic) from the rock that covers. 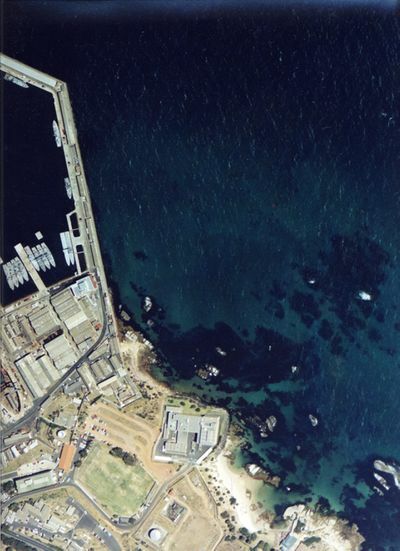 About 440m offshore near Phoenix shoal, to the east of the Simon’s Town harbour, towards Noah’s Ark rock. The Phoenix was a British ship of 500 tons, built in 1810. It was wrecked a little to seaward of Phoenix Shoal in Simon's Bay on 19 July 1829 while on a voyage from Ceylon with passengers and a cargo of sundries, part of which was saved. No lives were lost. She was armed with two cast iron cannon. Some of the iron ballast can be seen on the reef, while her stem lies buried in sand. Maximum depth is about 10m. Scattered low to medium profile reef on flat sand bottom. Whale vertebra and rib or jawbone on sand. Encrusted iron wreckage on sand at S34°11.388', E018°26.898'. Buried but with a bit showing above the sand. Possibly structure of the Phoenix? Geology: Late Pre-Cambrian granite of the Peninsula pluton and fine quartz sand. This is a shallow dive, in an area well protected from south west swell, but quite exposed to the north-westerly wind, which may raise a bit of a chop and make it difficult to find the wreck, though unlikely to cause much surge. The north-wester can cause a current that sets east in this area. The site is exposed to south easterly winds and chop. The site is usually at it's best in winter, but there are also occasional opportunities during other times of the year. Parking is adequate and tarred (since the aerial photo). The parking area is used by tour buses, use the smaller marked bays. Usually a shore dive, but also sometimes accessed by boat from Miller's Point slipway. Turn off the main road at the IMT sign at the end of the long brick wall enclosing the navy dockyard. Pass the sportsground and park behind the IMT building. Access to the beach is through the gate to the beach to the right of the IMT main gates, over the dunes to the beach. The water is shallow to the left near the building and there is some dense kelp around the boulders. Wreckage of a wooden ship of historical interest. This is not a site with much to photograph, and macro equipment is most likely to produce worthwhile results. Occasionally in good visibility it may be possible to get good results with a wide angle lens and natural light. Swim straight out to the wreck on the surface, Dive and explore the wreckage, then swim back to shore on compass bearing 255° magnetic. No special equipment required, A compass is useful for navigating back under water at the end of the dive. This page was last edited on 26 November 2010, at 12:14.